Incidents like this give “dark tourism” a bad rep where people are often lambasted for travelling to places with death and suffering. They’re often questioned for its ethics about turning human suffering into a viewing commodity, like an “amusement park” for death. With the rise of Netflix’s new “Dark Tourism” documentary and number of museums that highlight the length and breadth of human suffering in different ways, Dark Tourism has become a popular term and a tourist attraction. We as a society are fascinated by death, but we find it disturbing that our ancestors attended public executions in the same way we might watch a football match. Back then, the most horrifying viewings were often deemed okay and appropriate to gawk at such as the gladiator contest games of ancient Rome, the pilgrimage route to sites of burial or crucifixion and mass public executions of the Middle Ages. The debates are endless but what carries forward are people’s motivation to visit the Dark Tourism sites. For some people, it is about wanting to understand the damage to nature, life and civilizations that humans are capable of doing and for others, it is to understand the abandoned places that are lifeless, forlorn and forsaken that may instil fear or admiration. Here are the stories and grim tales from other travellers who found a personal connection with the dark tourism sites and destination that they visited. Auschwitz – it is a name that is synonymous with pain, suffering and murder. A place I had wanted to visit for many years to try and understand ‘why’, but I left with more questions than I had gone with. I did not know how I would feel while we were at one of the most notorious Concentration Camps of WWII. We started our day at the Auschwitz camp by joining an English tour group. We believed we would get a deeper insight into what had happened there by joining a guided tour. Our guide walked us through the history of the former Polish Army barracks to what it became infamously known for. Many of the barracks have been turned into museums that give you a timeline of what happened at the camp, what had happened within that specific barracks and other major moments during the war. There were rooms within the barracks that housed many of the personal items that Jewish people had bought with them when being transported to the camp like pots, shoes and suitcases. Looking at them left me speechless, there were just no words. From here, I took a short ride on a bus out to Auschwitz II or Birkenau as a part of my guided tour. As the towering gateway that dominates my line of sight came into view a scene, I didn’t think I could be ready for what it held behind it. This is where majority of prisoners that worked in the area were held in wooden huts that seemed to go on forever on either side of the train tracks. It was also the place where people were murdered in gas chambers and set to the crematoriums nearly straight after getting off the trains that had come through that dominating gateway. It was here that I felt sadness; a deep sadness but no hate. People have asked me what it was like and I tell them I got a feeling that this was a learning episode. I learnt how so many people had their entire lives taken, stripped bare and still kept their humanity; some extraordinary bravery and some extraordinary cruelty. It is a place that I will never forget but it made me realise what humans are capable of doing and this is something that should never be forgotten. ﻿Museum of the Second World War is one of the most remarkable places in Gdansk. Every adult who visits this beautiful seaside in the Polish city should definitely head to WWII Museum. When I visited the Museum of the Second World War in Gdansk, it was a difficult experience. War is the worst thing which can happen in this world. It is worse than any epidemic or natural disasters because those are calamities that kill people regardless of their status or origin. But war is the most unjust thing in this world because it kills mostly innocent people or soldiers who do not want to participate in it. All this is clearly shown in the museum. For me the most disturbing exhibits are photos presenting life and death of innocent people during the Second World War. I felt deep sorrow and regret for all those unfortunate human beings who happened to live during such a traumatic period. In the museum, I witnessed many personal possessions belonging to the war victims. One of the most distressing exhibitions is a wall filled from the bottom up to the top with suitcases. Those suitcases belonged to people who were kidnapped and taken to the concentration camps. I think this museum is important and necessary. Necessary to remind us that no such thing as war could ever happen again. We should remember our horrifying past and do our best to never repeat it. ﻿Of all the memorial sites and museums in Warsaw, the one that stayed with me the most was the former Szucha Gestapo Prison, today it is also called the Mausoleum of Struggle and Martyrdom. When the building was opened after WWII, 5,578.5 kg (12,298 lb) of ashes were discovered. This was all that remained of the victims of the mass executions carried out by the Nazis within the prison and surrounding neighbourhood. I have been to many dark tourism destinations and sites over the years, but Szucha was certainly one of the darker places that affected me. It felt evil. As you enter the museum, you are confronted by the faces of the victims projected across a screen. After a short video, they recount the terrors of the Szucha prison, and you can walk through the building - which was kept as it was found (minus, of course, the ashes, which were buried in a local cemetery). The whole museum felt very claustrophobic. You can see torture instruments and the silhouettes of officers’ feet pacing back and forth just above your head. At the end of a long hall is a video of a prisoner being struck down, only to repeatedly get up again. It is simultaneously inspiring and devastating. I believe the Mausoleum of Struggle and Martyrdom is an incredibly important place to visit. Whether you consider yourself a dark tourist or not, this museum tells a powerful story that we should never forget. ﻿In a post-Soviet world, the Southern Armenian stretches is a rural wasteland filled with signs of decay and stories of Armenian brothers who fought in the bloody Nagorno-Karabakh war in the 1990s, a territorial and ethnic conflict between Armenia and Azerbaijan over the disputed region. From what I gathered the initial fortune seemed to be with the Azeris, with the Armenian militias often had to make do with their homemade and improvised weapons. This was further seen in the Karabakh war memorial where a high proportion of them lost their lives here. On my roadtrip to the Caucasus region in the Southern Armenian stretches, the eeriness of the provincial town was not a usual dark tourist site, however the combination of cemeteries, fragments of the Soviet past provided a window of what it was like for Armenians during the Soviet era. With abandoned derelict factory buildings and the grim, dormitory blocks surrounded by rusting oil tanks and rickety machinery overgrown with shrubs, I imagined workers leaving everything behind in a rush and how their foundations of making a living were permanently destroyed. Armenians had massive reserves of gold, copper and molybdenum - the very riches of their country but they were all lost to the government to build roads, infrastructure and banks, and had nothing to contribute in terms of industry and science. Looking back, as I met locals on the town, there was a certain sadness and void in their life - most of their children had fled to Russia to make a living leaving the aged and poor left behind with scraps of their belongings used to make a living. It was sad how the domestic economy is in the doldrums, and how Armenian families are trying to keep it together post-Soviet collapse with bouts of political turbulence. Coming to Silmi-do (Silmi island) in South-Korea is a physical and emotional journey towards a dark story of assassination. It's not exactly easy to reach - a string of rocks only appears during low tide, and there’s no ferry or roads to this uninhabited piece of land. The abuse and harsh training done to people can be heart-breaking to read about. While there's very little on the island itself to see, it does reflect the military's attempt to erase this part of history. I hope the story will be better told in the future to ensure something like this never happens again. With the time machine set for 1968 – South Korea was raided by North Korean commandos. This left over 130 South Koreans killed or wounded, so the chief of the Korean Central Intelligence Agency organised 'Unit 684'. This group of 31 people was made up of “petty criminals or unemployed youths” or “dysfunctional social outcasts and criminals under death or life sentences”. In any case, they were promised money and jobs if they succeeded in assassinating then-North-Korean leader Kim Il-Sung. Seven people died during the years of harsh training and abuse, but they finally had the chance to set out on their mission. As relations between North Korea and South Korea improved, however, the mission was cancelled and the unit was ordered executed. The unit revolted and hijacked a bus on August 23, 1971 to make their story known. The army forced the bus to stop, and twenty were killed or committed suicide; four survivors were later executed by military tribunal. After the executions, the military covered up the case, which didn’t become well-known by the public until a book was published in 1999 and the movie Silmido released in 2003. The Korean government officially acknowledged the historical events as fact in 2006, and the families eventually sued, winning 273 million won in compensation in 2010. The movie about these events was the first Korean movie to sell 10 million tickets. Before going, you should watch the movie Silmi-do which sets the scene of anguish and harshness. It'll give you some connection to this otherwise barren island. According to me, it's definitely a disturbing experience to see a peaceful place used in such a horrific way, but like other 'dark tourism' sites and destinations, it's the context and the stories that give an empty place meaning. Jeju Island is one of the most beautiful islands and best places to visit in South Korea, it has everything to offer to travellers, from stunning beaches to amazing food. However, Jeju Island has a very dark history, this is something very little people are aware about, even the Koreans. From 1910 till around 1945, Korea was occupied by the Japanese. At the end of the 2nd World War, the peninsula was liberated from this occupation. Unfortunately, this wasn't the end of war time for Korea. Jeju Island was torn between communist revolts and anti-communist campaigns. Over the span of 1 year (April 1948 till May 1949) over 15,000 people were killed. Even though this was mainly a battle between opposite government parties, the local inhabitants suffered the most. Occasionally whole villages were mass executed, including the children and elderly by the government. Almost 10% of the population of the small island were killed and many more fled to mainland Korea or Japan. The sad part about this is that the whole event was and still is censored and repressed. The government only acknowledged its responsibilities for the killing 60 years after the Uprising has taken place and damaged families have never received any compensation for their loss. There is a Jeju Dark tour that takes you around the island visiting memorial sights and important landmarks. The tour is extremely haunting, as at some point you'll have the chance to listen to the stories of a woman who survived one of the mass shootings. She and her little brother managed to escape when they were only 10. Even though she talks in Korean, you can hear the pain and struggles she went through. I have been on a 2 day tour with a non-profit organisation that fights for the human rights of the families who have experienced this in Jeju. I still remember the day the Chernobyl Nuclear Power Plant exploded. I was 10 years old, and the news came as I was out on a school trip with my classmates. Teachers looked at us worried, not sure of what would happen next. When I got home, later that day, the scale of what had happened became clearer. It was a disaster. Images of an eerie, abandoned place were all over the news. Fast forward 30 years, I went to the Chernobyl exclusion zone, on a very cold winter day. Seeing in person all the places that, until then, I had only seen in photos turned out to be absurd. Covered in a thick blanket of snow, the silence of places like Prypiat amusement park (where the famous ferris wheel was located) was even more deafening. Nobody ever rode that wheel - it was meant to be inaugurated in May 1986, but the incident occurred a few days before. A visit to Chernobyl is more than a visit to a dark tourist destination. It serves as a reminder of the damage to nature, life and civilizations that humans are capable of doing; and as a warning that we should take better care of the world we are living in. ﻿On my first visit to Kazakhstan, I went to the Alzhir museum and memorial complex in Malinovka. Alzhir was a Stalinist prison camp for wives and children of men accused of betraying the Soviet state. Kazakhstan has several former gulags that are now museums, but Alzhir is one of the most accessible. My visit was an eye opener. At school we only learned briefly about the Soviet Union and almost nothing about Kazakhstan. For example, I heard about the gulags, but didn’t know there were so many. The museum is rather simple, but it was here that the extent of Stalin's terror truly got to me. It became real in the possessions that prisoners left behind and the letters that they sent back home. Afterwards, I felt anger at the unfairness of it all. How innocent the women and children were. How their lives were disrupted by being seperated from their families and homes. How difficult it must have been to have to work in the extreme climate of Kazakhstan's steppes where it gets to -40 degrees in winter. And how little attention this part of history gets in the West. One of the good things about travel is that when we visit places like these, we learn more about history from different perspectives. Kazakhstan has many stories to tell and what happened in Malinovka should not be forgotten. One of the most surreal experiences I’ve ever had was visiting the Stalin Museum in Gori, Georgia. Before I visited the Caucasus, I assumed, like many people, that the Soviet Union’s most notorious revolutionary was Russian. But Joseph Stalin was actually born to Loseb Jughashvili in 1878 in Gori, a small city roughly an hour west of Tbilisi. Even more surprising to me was the fact that in Georgia, Stalin is not entirely loathed. In Gori, there is something of a personality cult surrounding the former leader, probably buoyed by the fact that the association with Stalin is a major boon to tourism. The Stalin Museum documents the dictator’s early life in Gori (he studied there before moving to Tbilisi, Batumi, and later to Siberia). As a big believer in learning from history’s past mistakes—even the darkest chapters—I thought the chance to trace Stalin’s influences and the origins of his ideology interesting. It was, however, confronting to see the way that ideology played out is almost completely glossed over or whitewashed, both in the exhibition didactics and in the tour guide’s script. I was drawn to visit Gori and the Stalin Museum because of its dark tourism appeal. I came away knowing a little bit more about the man and about Georgian history, which itself was fascinating. Human history is riddled with tales of exploitation in service of “progress” and the Spanish colonization of what is now California is no exception. In the late 1700’s Spanish colonialists and the Catholic Church began to settle California by building a string of missions along The Camino Real (or Royal Road). The Santa Barbara Mission was established in 1786 and it remains one of the most beautiful and well-preserved examples. I toured the Santa Barbara Mission while taking a California coastal road trip. While there, I learned about how the mission became the headquarters for all of California’s missions; housing soldiers, developing agriculture and “spreading the word”. All of that is true, but there is a heavy coat of whitewash covering those exhibits. What the museum won’t tell you is that the modus operandi of the Mission was to forcibly convert and then enslave the Native Americans. Uprisings were quashed with harsh violence and the white man’s diseases further decimated the population. Prior to the missions, there were 300,000 Native Californians, but by 1834, there were only about 20,000 remaining. Furthermore, four thousand Chumash Native Americans are buried in the Santa Barbara cemetery. Economic progress came at a great price for the Chumash and other Native Californians. It’s important for visitors to the Santa Barbara Mission to understand that historical context while they tour the mission and enjoy its graceful architecture. Turtle Mountain tragically destroyed the lives of many who lived in Frank, Alberta in Canada. The mighty mountain reached its breaking point in 1903 when 80 million tonnes of limestone came tumbling down toward the town and its residents. Within just 90 seconds, Frank was changed forever. As you drive in the direction of the mountains within Crowsnest Pass, Turtle Mountain is clearly visible. One side of it is entirely covered in dust and limestone, while the ground below is littered with massive boulders. 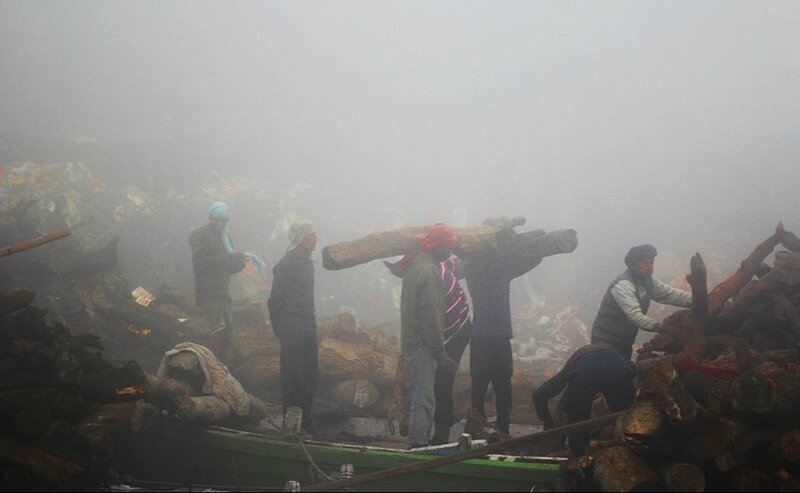 A sombre feeling filled the air as I looked at the rubble, knowing full well that the bodies of people who were trapped under the landslide are still buried beneath. The lives of those who lived in Frank and met their ultimate demise, being buried beneath the rocks that killed them, will forever haunt the shattered landscape. I felt awful knowing that the exact number of victims was never confirmed and some people killed in the landslide would be stuck beneath the aftermath forever. The scene emphasised the fragility of human life and I found myself appreciating it a lot more as I left Frank. To witness how destructive the world in which we live can truly be really opened my eyes. Overlooking the destruction of the landslide is the Frank Slide Interpretive Centre. This museum explores the history of the area, the survivors of the landslide and looks at how the inhabitants of Frank were warned about the impending doom of the mountain that would change Canadian history. The Killing Fields at Choeung Ek and S-21 Prison (Tuol Sleng) in Phnom Penh are Cambodia’s most notorious dark tourism sites but in central Cambodia, near the town of Kampong Chhnang, there is an abandoned military airport that has an equally tragic history. Established in the 1970s at the behest of the tyrannous Khmer Rouge, the airport was built using forced labour and it is thought that a minimum of 10,000 Cambodians lost their lives during its construction. Some estimates even put this figure as high as 350,000. It is unlikely that the real number will ever be known but, what is certain is that those who did perish were subject to terrible conditions and horrendous acts of barbarism. It’s hit and miss as to whether you are permitted entry to the site because the airport is still guarded by military personnel. We were lucky and were granted 30-minutes of exploration time. We had cycled out to the airport and, once inside the perimeter, we made a beeline for the 2.4km-long runway, which was still in remarkably good condition. Locals with a craving for speed use it to race up and down on their motorbikes. We had a go at getting up a decent momentum on our pushbikes but the sensation of enjoying ourselves on a strip of concrete that had caused so much misery and death to others didn’t sit right with us and so we didn’t play that game for very long. During the course of World War II, the Thai-Burma death railway was built by Allied prisoners of war and local slave labour. The route of the railway was defined by the invading Japanese and the railway was built primarily by hand. Hellfire Pass or the Konyu Pass is quite simply the most moving place I’ve ever visited. There is a museum here to the men who built this railway, those who suffered and died or survived. The jungle is reclaiming the track and its possible to walk a 2.5 kilometre part of the route of the Death Railway while listening to a moving audio guide that explains the history of this area. Walking through the dark walls of the cutting, the silence of the jungle is oppressive and serves as a memorial to those who were forced to build this railway. “When you go home, tell them of us and say we gave our tomorrow for your today.” - the audio guide tells personal stories of survivors. If you stand quietly as the walls of the cutting close in, you can almost hear the whispers and distant echoes of those who didn’t come home. Hiroshima is not what I expected when I visited. It is not a city focused solely on the memory of the catastrophic nuclear bomb attack in 1945 that wiped out the city and killed 140,000 people that year and many more later. Instead, it’s a vibrant, modern city, much like Tokyo. The people I passed as I walked out of the railway station were just ordinary people going about their lives. The buildings are modern and tall and the streets are crowded with pedestrians and traffic. It all seemed so normal! Taking a bus, I found my way to Ground Zero: the bomb exploded 600 meters above this spot. The only indication of this history-changing event is one informational sign in a very ordinary city intersection. My next stop, the Atomic Bomb Dome, was different. Seeing that ruined building struck a chord somehow, and I spent much of the rest of my day in Hiroshima fighting back tears. But Peace Memorial Park, dotted with memorials, offers solace somehow. Perhaps, it’s the hushed greenery that does it, but walking there and visiting the memorials invites quiet contemplation. The Peace Memorial Museum, though, also in the park, adds some hard reality to the emotion, confronting visitors with the harsh facts of nuclear weapons. Leaving the museum and then the park was a bit jolting. It was an abrupt return to modern urban life, which, in Hiroshima, does not revolve exclusively around their nuclear bomb victim past. ﻿Rabbit Island is an island in Japan, known as Okonushima, and it has become famous for its rather large population of rabbits. They roam the island freely, and the reason for them being there in the first place is due to experiments. But the island was abandoned and the rabbits escaped and repopulated the island. What makes it a Dark tourism site and destination is the dark history of the island. It was here that the Japanese government manufactured thousands of tons of poison gas. It was a top secret facility during World War II. The rabbits were used as test subjects to determine how lethal the poison gas were, and thousands of the furry little bunnies were killed in the experiments. It was very strange to see the old abandoned buildings and it looked like they came straight out of a horror story. Nature has taken over and you're not allowed to enter at most places. There are signs explaining each site though, both in English and Japanese. There's a creepy feeling crawling up inside you every time you find yourself among old buildings without other tourists around. It's like the whole place is being haunted. Perhaps by the Chinese who were killed by the poison gas created here, or by the massacre of laboratory bunnies. It made me think of what humans are capable of and I wish that a place like this will never exist again. ﻿Ground Zero is now the site of the National September 11th Memorial & Museum. The museum is located underground where the base of the Twin Towers once stood and filled with countless artifacts from that day. As I went through the museum, I got to know more about the victims and tried to imagine what it would have been like to be in New York City that fateful day. I was heartbroken to see the “The Last Column” which had become an unofficial memorial with messages to their loved ones, friends, and colleagues. It was the last column of the buildings to be removed from Ground Zero and many first responders were thought to be buried nearby. Conversely, I felt a sense of gratitude seeing “The Survivors Staircase.” These Vesey Street stairs remained largely intact after the attack and was the path to safety for many survivors. Inside the Timeline Exhibit, I learned minute by minute how the events of the day unfolded. Hearing the news clips, recordings of phone calls, and voicemails made it feel so close and so real. In the Memorial section, I learned more about some of the victims. In the Recording Studio, I recorded my personal thoughts about the Museum. The September 11th Museum is not a museum to go through quickly. I would recommend allowing five hours for your visit. 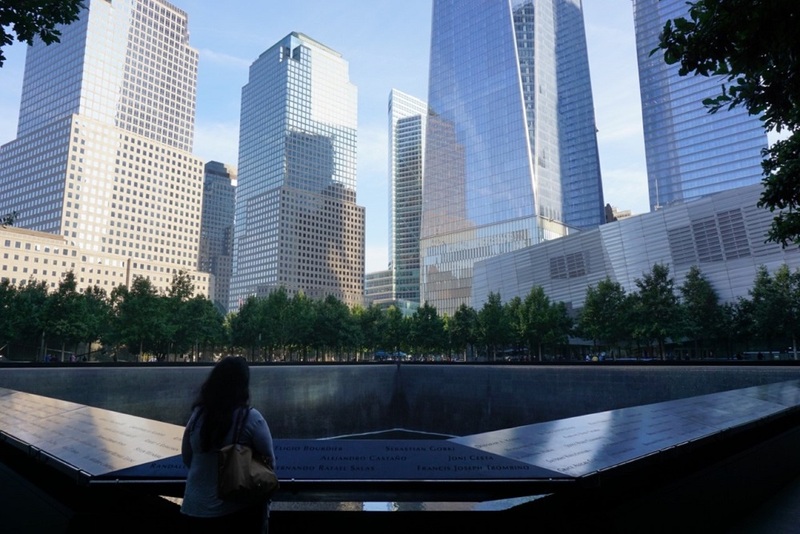 In addition, allow some time to visit the September 11th Memorial. Walk around the fountains and read the names of the victims of the attacks. It’s powerful as well. One of the most difficult places to visit for me was Varanasi. I first heard about it a few years before I arrived there and I found it fascinating. I couldn’t comprehend (and maybe I still can’t) the rituals that happen there and how some people believe so much in the spirituality of Ganga River and visit the river when they feel that they don’t have days left on this planet. I prepared myself as much as I could, but Varanasi still shocked me. I remember the first day there, I arrived at 5am and checked in to my hotel, which was outside of the city centre. I will never forget the sounds of bells and the people running towards the river holding planks with bodies over their head. I looked on the window, and that was my first encounter with death, so close. “Women are not allowed to come to the funeral”, our guide mentioned. Before they lit the body on fire we decided to leave. It was too much, and none of us wanted to see it. I don’t know how I would recommend a visit to Varanasi because you need to be prepared for what you are going to see. It’s important to, as a tourist, respect the privacy of the people and don’t take any photos or intervene in any way in the funeral processing. You can watch, but with respect. 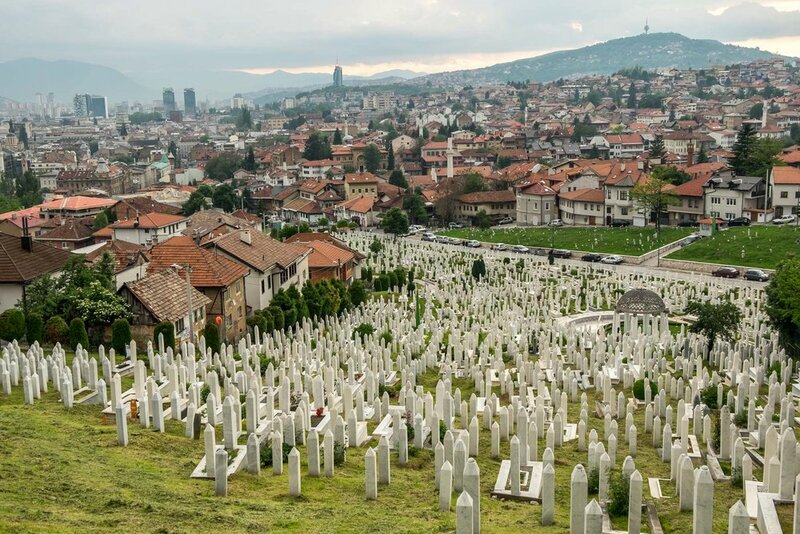 ﻿For anyone who remembers the Balkan War in the 1990s visiting Sarajevo is like being in the real-life history lesson. The city was the scene of the longest siege in modern European history, it lasted almost four years, and over 11 thousand people lost their lives during these tragic time. Even if the city has moved on since then, you can still find numerous war remnants all over the place. From the museums telling about the difficult times to the bullet holes, commemorating boards, cemeteries where all the graves come from years 1992-1996 or so-called Sarajevo roses - spots on the street where the mortar shell killed at least one person. Seeing all these war scars gives you another perspective of this multicultural, cheerful city. You can feel the ghosts of the pasts around every corner (that's what happened to me at Markale market - the site where in two different massacres over 100 people were killed) and even if the life goes on, the war is still very much present in Sarajevo. The steep road that clings to the cliffside as you drive down into Pisagua helps to give a sense of quite how remote this tiny, near-abandoned town on the coast of northern Chile. Back in its heyday in the late 19th and early 20th century, it was home to English immigrants, brought here by the allure of saltpetre (nitrate) to build fancy wooden mansions overlooking the ocean. However, the age of saltpetre ended a few decades later and the town became known for a far more sinister reason. In 1989, a mass grave was discovered in the cemetery, containing 19 bodies, thought to be just some of the 2,500 political prisoners that were held in a concentration camp here during the military dictatorship that governed Chile between 1973 and 1990. The town itself receives a mere handful of locals - and even fewer foreign tourists each week, drawn here by its macabre history and faded but still sadly beautiful buildings that act as a visual metaphor to the area’s demise. There’s no public transport to get here from the closest city, Iquique, However, if you’re heading past along Ruta 5, it’s worth the detour to see the monument that has been erected in honour of the dead and to take in the surroundings of this town that has been abandoned to its fate. I have always had an interest in visiting battlefields to learn about the history of events that ultimately led to war. There is a quietness that hushes over battle grounds, complementing the solemnness, and although these places carry such loss, there is peacefulness in the silence. Culloden Battlefield in the Scottish Highlands is surrounded by moorland, with mosses and grasses making up much of the landscape. As you walk the pathways through the battlefield, much of what you hear is the slight rustle of grass and a hint of birdsong. Headstones carved with the names of various Highland clans who lost their lives in the battle at Culloden carries the weight of historical significance – Culloden marked the near-end of the Highland clan system, families for which many Scottish counties, towns, and still-standing castles were built and named. Sadness washes over me when I read the different names – the battle lasted less than one hour, with nearly 2,000 people perishing against British Government forces. My ancestors fought in this battle, so coming here feels like coming home and saying goodbye. It is hard, however, to feel sad in such a naturally beautiful place. Vietnam is a country stocked with dark tourist destinations and sites - the War Remnants Museum and Chi Chi Tunnels in the south, and President Ho Chi Minh’s mausoleum in the north in Hanoi, where the Communist revolutionary leader’s embalmed body remains on display, long after his death in 1969. “Uncle Ho”, as he is affectionately called, is widely loved by Vietnamese citizens for fighting for the reunification of the country - in order to visit his last resting place, you will have to wait in a line for hours, amongst thousands of other visitors, many of which are elderly and frail Vietnamese veterans who wish to see his remains before infirmity ceases their travels. While Vietnamese citizens make up a portion of visitors to the mausoleum, a significant chunk of tourists are foreign travelers, largely unfamiliar with what Ho Chi Minh represents for the country, waiting alongside me in one of the longest lines I’ve ever seen. While endlessly standing in the hot Vietnamese sun to reach Ho Chi Minh’s remains, I couldn’t help but wonder: are foreign visitors stopping at the mausoleum to actually learn more about Vietnam’s history or instead, drawn to the macabre nature of seeing a human corpse on display? Admittedly, my visit to the site was, at least in part, due to the latter component, but I can honestly say that, speaking with the Vietnamese citizens waiting around me in line to pay homage to their leader, I learned more about the loyalty, resiliency, and pride of the Vietnamese people than from any other attraction in Vietnam (including the mausoleum itself!). In fact, waiting to get into the mausoleum is essentially like participating in the world's longest funeral procession, almost 50 years in the making. Visiting the Catacombs deep below Paris and one of the most unique and morbid experiences you can have while traveling Europe. If you don't know the history of the Catacombs, in the late 18th century Paris' cemeteries were overflowing and there was an overwhelming need to find a solution. Literally, cemeteries were collapsing! So, they moved the bodies from the cemeteries into a large network of tunnels under the city, filling it over time with the remains of millions of Parisians - over 6 million of them actually. Journeying deep below the surface of the city, the Catacombs are cold and dark. Skulls and bones line every wall, arranged into decorative displays of "art". There's something so dark about just how many skeletons there are down there, all anonymous. You have to wonder who's bones you're looking at and what their stories were. In death, everyone is equal in the Catacombs. I find that there's something deeply ironic about the fact that Paris, the City of Love and City of Lights, has such a dark history just below the surface. It's no wonder the Catacombs were the setting for a horror movie, As Above, So Below - it really does feel like the entrance to the Underworld down there. I always recommend that any visitor to Paris experiences the Catacombs for themselves to see a different side of Paris. I found my visit there to be both creepy and fascinating, and overall, it makes for a very macabre and eerie experience. ﻿As one of several beaches that saw heavy fighting on D-day, June 6, 1944, Omaha Beach was among the deadliest. Omaha Beach was fortified by the Germans and contained numerous mines all over the beach. The steady stream of machine gun fire coming from higher points made Omaha Beach a death trap to the allied forces. Standing on the beach in Normandy and looking out into the water is a powerful experience. To be in a place that saw chaos, whizzing bullets, men falling into the water, and others dragging their friends across the sand with nothing to hide behind, is difficult to comprehend. There is quiet chaos, a wind that whips by, fueling images of the incoming boats and men jumping from the back. The beach itself is what one might imagine, sea and sand, wind and emptiness. But overpowering historical images recalling what took place easily overcome any visitor to Omaha Beach. It is necessary to visit this beach, one of several beaches which saw heavy assaults occurring against Allied forces during World War II. It is one thing to read about how men were pouring off boats and gunned down, and quite another to stand on the beach to understand the elements coming together to add to the difficulty: the wind, the sound of the waves, the smell of the sea, the fog, and the quiet silence that hangs in the air. If done ethically, are there any dark tourism sites that you’ve visited and found a connection with the place? Share with me in the comments below!